She woke up and walked through the balloons I hung from her doorway, padded downstairs and ate an entire family of Mickey shaped pancakes filled with chocolate chips made especially for her by Cody. 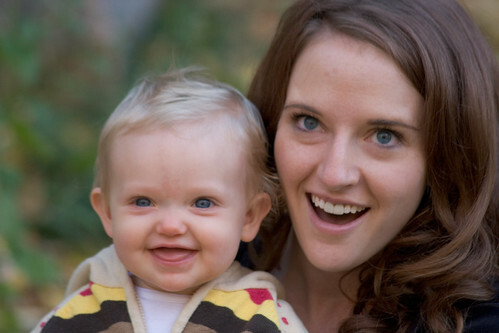 I gathered up the baby at lunchtime and met her in the school cafeteria with a cheeseburger and chocolate milk. Between lunch and school bus drop off I gathered up all her gifts, bought 8 balloons (7 for her age, one to grow on) and decorated her cake. She wanted a big enormous hot pink cake with a castle, trees and Ariel. I compromised with a medium cake, brown sugar, blue sprinkles and topped it with those strange little Squinky things she thinks are amazing. 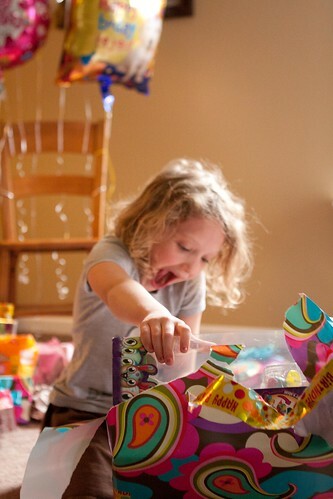 She declared it the BEST BIRTHDAY EVER and our living room turned into a wrapping paper tornado. We picked up one of her little friends, went to dinner, came home, had more cake, made her new scratchy marks and I put my fresh seven year old to bed. She squeezed my neck, thanked me for her presents, her cake and dinner and said it was the best birthday she could have ever imagined. She is such a magical little creature. This post made me feel so shiny. Thank you for sharing! YAY!!!! This made me tear up with happy tears!! Oh I’m so so glad it was a wonderful day. Her face made my insides smile! Happy birthday to Addie and I am so glad the two of you got to have a best. birthday. ever. I am so glad this day turned out better than last year’s day. So, this is random, but I really want to see a side-by-side comparison of A and V. Like, pics of each of them at a certain age? I can’t decide if they look as alike as I think they do, or no. Pretty please with weird Squinkies on top? I love that picture of you two. So young and sweet! This is so much fun to read… My heart is full for both of you. You really did a great job making her entire birthday something very special! Well done! I’m impressed. She is a very beautiful and happy girl! I am so very happy for all of you. You have done a great job with her! What a wonderful day! For BOTH of you. Hurray! What an awesome birthday!! 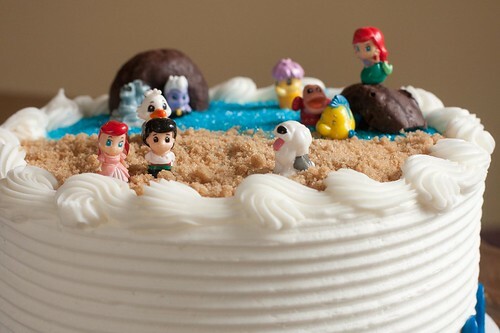 Also, mmm, cake. Me jealous. Oh my goodness. How about, I’ll dress you like Ivy and you be my mom? You are such a great mom. And Squinkies!! Really cool! Great ideas! The excitement in her face is priceless. 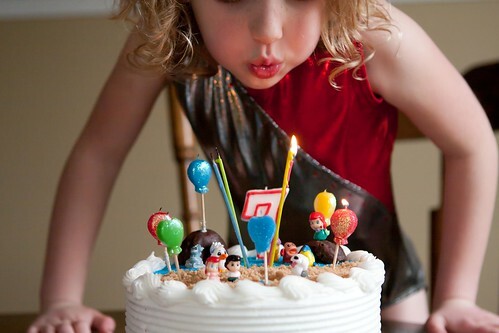 This is the birthday of little girl dreams. Perfection. I am so glad the day went well and you both have happy memories. Happy birth-day to mama, too! 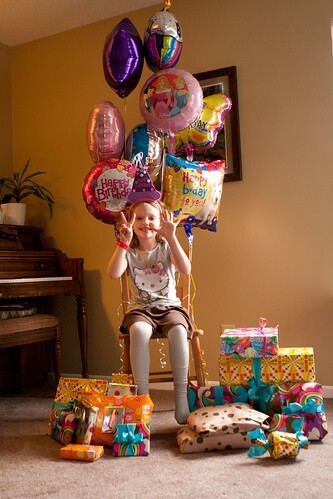 Awww, happy 7th birthday to her! I swear I thought that was a photo of Vivi! 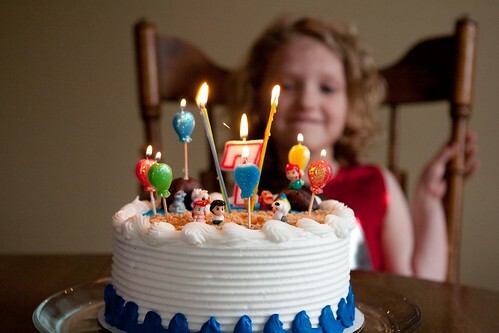 A perfectly spectacular day for an extraordinary 7 year old love of yours! 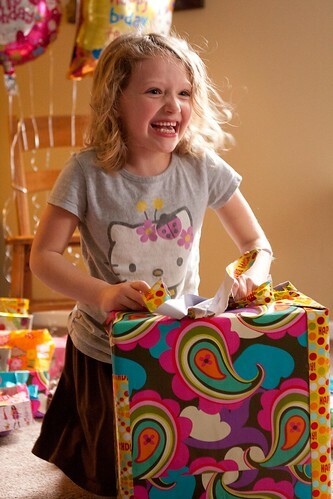 You make birthdays so happy and so incredibly wonderful – you make me want to do the same for my little girl always!! Dreams are made of that birthday. Oh how this made me smile the whole time reading!! It looked like a beautiful day, and I’m so happy it turned out better for you than last year’s. Nothing can beat that look of excitement on her face in every picture. Oh, I know her birthday would be awesome and filled with balloons!!!! Made me smile just reading about it! That looks like the funnest birthday ever! 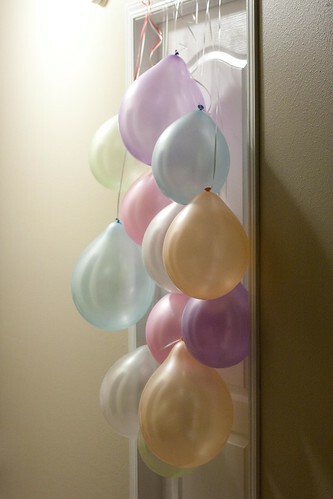 I am definitely stealing that doorway of balloons idea! Love the idea of a birthday chair and is that a donut in the cake? My kind of birthday. Sounds like it was perfect. So sweet! Happy belated birthday, A! I am so happy this day turned out to be so wonderful! You are such a good mom. Will you teach me all the cute things you do (i.e. seven balloons plus one to grow on)?